Lynnette uses her professional expertise – and her personal experience – to conduct personal finance workshops and seminars, and give keynote addresses, all around the country. Some workshops are sponsored by companies or non-profits and may be free of charge. Other seminars are conducted at conferences, conventions or special events for a modest fee. 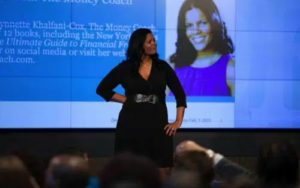 Additionally, TheMoneyCoach.net hosts its own low-cost group seminars, conducted by Lynnette as tele-seminars or webinars. To find out where Lynnette’s next public seminars or workshops are being held, or to get on the list for her group tele-seminars and webinars, please, contact us now.